The way our program works is we act as the facilitator in coordinating all aspects of selling your vehicle to raise a charitable donation. By welcoming multiple charities to participate in our program, it gives you the opportunity to choose where you want your donation to go. It also opens doors for so many charities that would otherwise miss out on the opportunity to receive donated funds from generous people such as you. Several programs that accept vehicles as a form of donation are very limited because they only have the ability to recycle vehicles. At Donate a Car Canada, we have two possible sale procedures that help us to maximize the highest donation amount possible for the charities. The first way we can process your vehicle is through the use of our auction agents. There are many factors that go into qualifying a vehicle for sale by auction. These include but are not limited to: drivability, type of mechanical problems if any, age, damage, visual appearance, and odometer reading. If it is believed that your vehicle has adequate potential value for the auction sale process, this method would be utilized. All vehicles sold at auction are sold with an ‘as is’ and ‘unreserved’ (sold to the highest bidder) status. This ensures the sale is final, as well as protects the donor from having to provide a warranty to the buyer. Processing costs are then deducted from the sale price, and the net sale amount is donated to the charity selected. The charity then sends a tax receipt to the vehicle owner for that amount. Processing costs can include lien searches, towing charges, gas, cleaning, auction and administrative fees. There isn’t a hard and fast rule or an easy way to predict an auction value, especially when sales are ‘as is’. What we can tell you though, is that we have had donations as high as $29,000 as a result of our auction process, so there really aren’t limits when you are considering donating a vehicle. If your vehicle is drivable, dropping it off at an auction house would eliminate a tow fee and therefore increase the amount of funds generated for your charity of choice. Tow rates vary significantly across the country, and the distance from the auction house also factors in to related costs. The second option for your vehicle is our recycle process. Using this process, your donation amount is most often $100. This is dependent on the area in which it is located, how far it would need to be towed, and most particularly the current price of metal being paid to recyclers. The vehicle will be picked up by our towing agent at no cost to you. If you wish to learn more about the donation process itself, click here. Many other questions may be answered on our FAQ page. 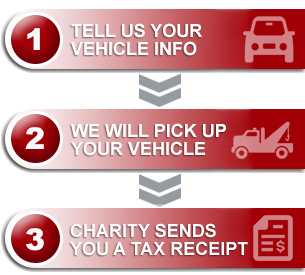 If you have a vehicle you want to donate, please submit your information using our DONATE NOW feature. It would be our pleasure to help you raise a valuable charitable donation!